You may have noticed some new additions to our website. We now have a link to a map of our current members. As you can see we have lots of volunteers in certain parts of the state, but we still need help and more importantly data from areas like the Florida Panhandle. As soon as the videos are done we will send out an e-mail and post them here. All of you should have received the first set of survey questions. We ask that you gather the data needed to complete the survey and do so when you get a moment. If you have any questions please feel free to contact us or post your comments and questions below. And don’t forget that you can now post a picture with your comments! 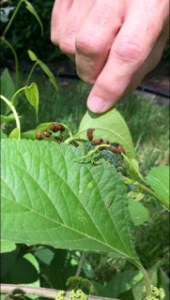 This afternoon we completed our Air Potato Beetle (APB) count and found 28 and several larva (APB release was June 2, 2017). The APB’s are doing a great job thus far! We are so thankful for this program that allows us to receive these APB’s and we enjoy watching the APB’s work! That’s great! And thanks for the picture. I released 2 containers of APBs on 6/30/17. I checked on them today (7/2). They have already spread far beyond the release site and have done far more damage than I expected so soon. I only saw 22 beetles, but the APVs looked like hundreds of them had been at work! I am VERY pleased and grateful. I am in an RV park. Wednesday mornings we have a social meeting, at which time (7/5) I will tell the other residents about the APBs and pass around pictures so everyone will watch out for the APBs and protect them. 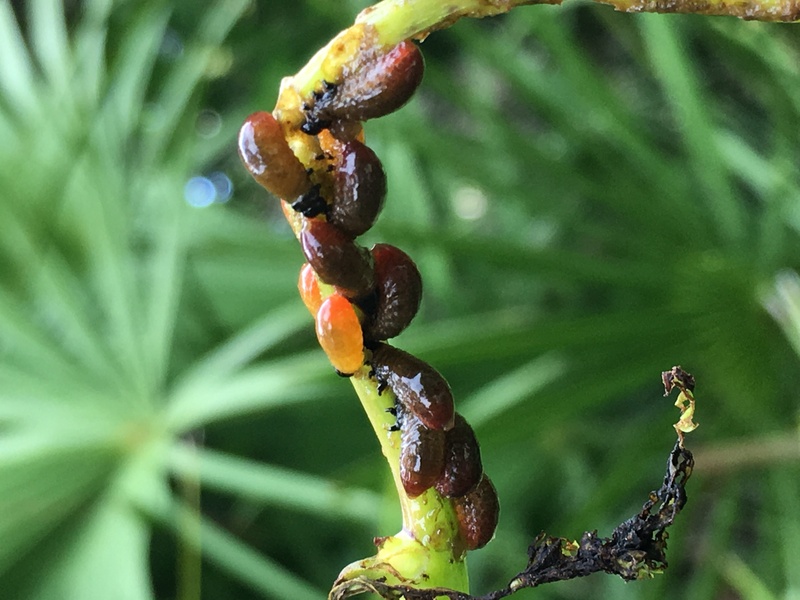 On July 11 I will attend the Florida Native Plant Society meeting in Sumterville and pass on the information to anyone interested – if it hasn’t been done already. I was in Palmdale yesterday, and unfortunately There were several more Air Potato infestations than there were last year. The beetles are active and just beginning to show damage. We are losing ground here. 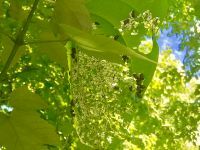 If you have beetles present you will be surprised at how quickly the population will grow and the amount of damage they can do during the rest of this summer. 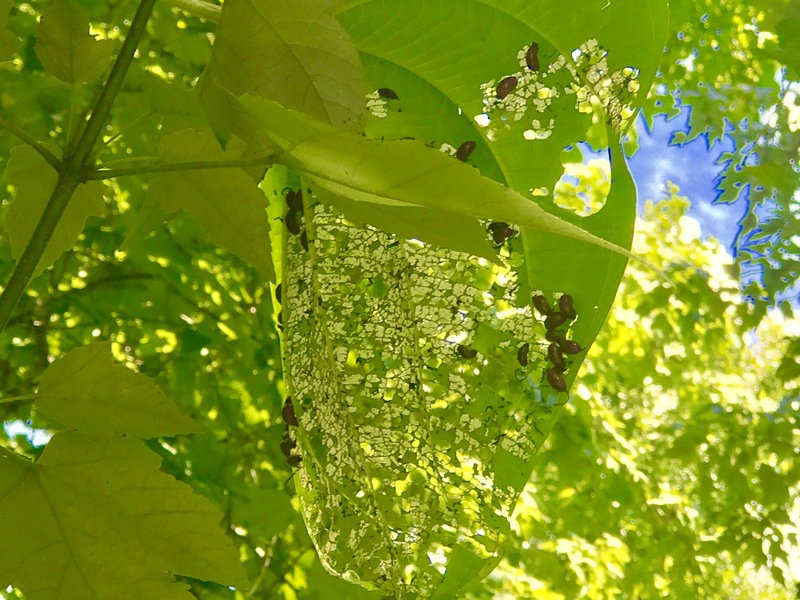 We’re SO delighted to be embarking upon our 3rd year in the battle against this invasive and unsightly nuisance! We’re seeing an exponential increase in the number of beetles/plant destruction, in just the past month or so on our 2.9 acre slice of native Florida, in the heart of this urban jungle we call Tampa.